Two days in the office and the Vanalikalikes have already figured out how to get filed. All except Pi, who is a portly little fellow. I also notice that all the papers in this drawer have a filigree of perforations from tiny teeth and claws which beg the question of why I am allocating them storage space at all. 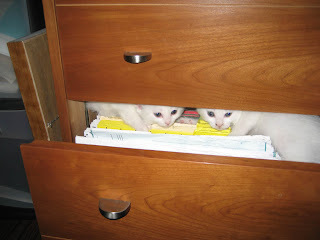 what cute, curious kitties. another example of why I do a cat count at least a couple times a day.